It is no secret that the gaming industry is changing drastically. In the days of the original PlayStation console, mobile gaming was limited to the black and gray “Snake” on a brick-sized Nokia. Now, with blockbuster titles like Angry Birds and Candy Crush Saga infiltrating the mainstream (and millions of Facebook news feeds), it’s about time that a peripheral became available to make smartphone gaming more comfortable on the thumbs. Prolific gadget leaker @evleaks posted two photos of what he claims is a Logitech gamepad designed for the iPhone (5 and 5s, specifically, it appears). The apparatus looks vaguely like a stretched out PSP, with a d-pad on the left, colorful Xbox-inspired A, B, X, Y buttons on the right, a pause button, and shoulder buttons at the top corners. Veering away slightly from a prototype that leaked back in June, the svelte new images show an enclosed back with a cutout for the camera and flash. It seems to be a no-brainer for iPhone accessory makers to dive into gaming peripherals for the world’s most popular smartphone – especially since Apple won’t be making its own gamepad. 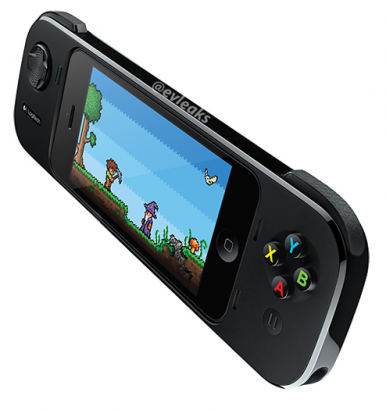 A recent study from IDC and App Annie showed that, for the second quarter of 2013, iOS and Android gaming dominated traditional handheld consoles. Revenue from iOS games alone was more than double the revenue from games produced for Nintendo’s 3DS and Sony’s Vita. Additionally, “Google Play games alone also generated more revenue than the entire portable console industry,” reported BGR. Perhaps Logitech will be the first company to free smartphone gamers from smudged screens and red thumbs. A more comfortable and responsive mobile gaming experience could be the death of traditional handhelds.